"Call me and call my image Santa Maria de Guadalupe"
The historical story surrounding this Marian apparition is truly fascinating. 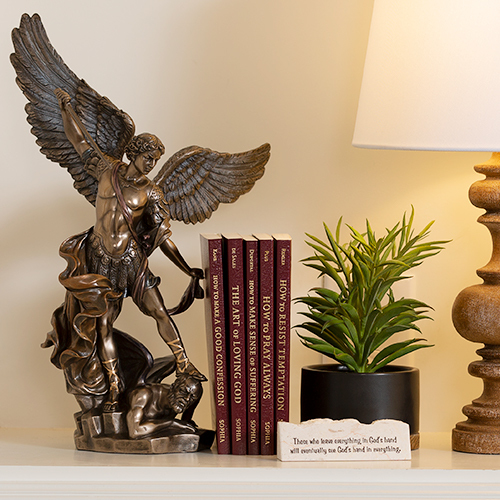 There are so many details regarding the time period and culture to which the image was revealed that combine to make this a truly significant apparition, not just for the Americas or for the Catholic Church, but for all of humanity. In addition, there is a such a fascinating story surrounding the image itself and its highly unusual properties. All of this detail cannot possibly be covered in one blog post . . . but continue reading for a sampling and links to more resources! 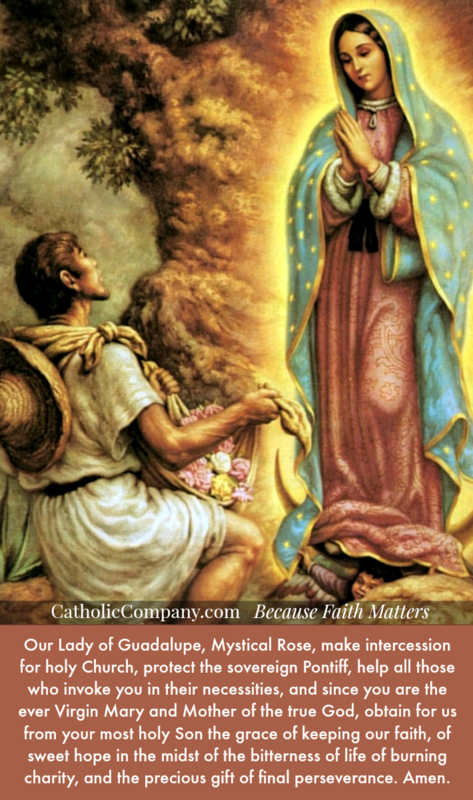 The Blessed Virgin Mary appeared to St. Juan Diego in the 16th century in present day Mexico City, Mexico. Juan Diego saw an apparition of the Blessed Virgin on the Hill of Tepeyac on December 9, 1531, which happened to be the feast day of the Immaculate Conception in that time. Our Lady requested that a church be built on that site, which Juan Diego dutifully relayed to the bishop. After a request by the bishop to prove her identity, Our Lady asked Juan Diego to gather roses that were growing on the hill (which were neither native to the area nor in season) and take them to the bishop. Juan Diego obeyed and placed the roses in his tilma (or cloak) to carry back to the bishop as evidence of Our Lady's appearance. Upon opening the tilma to reveal the miraculous roses to the bishop, there was something even more miraculous present in the tilma--a striking image of the Blessed Virgin Mary. In the image Our Lady wears the traditional garments of an Aztec princess. A black sash around her waist was a cultural tradition among the Aztec women that indicated pregnancy. 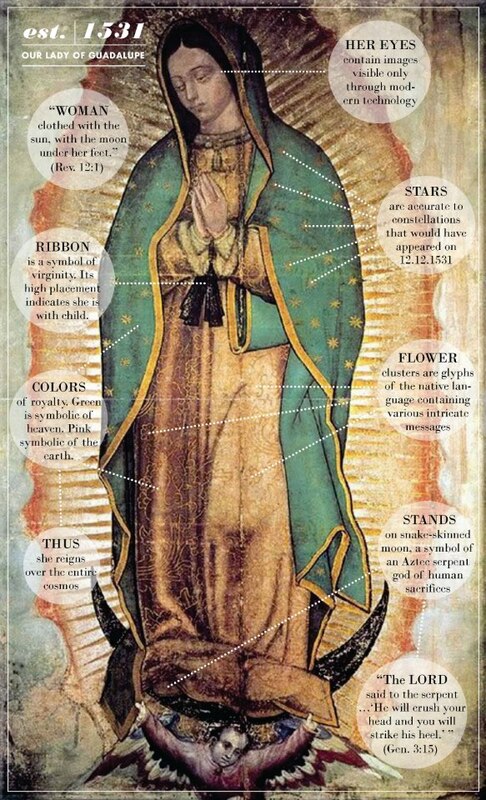 All the elements of the image point to Our Lady as being above the gods the Aztecs worshiped, while at the same time showing that she herself was submissive to the true Creator God while being pregnant with the Divine God-man that grew in her womb. By using only cultural symbols and no words, which the Aztec people could read as a codex, the miraculous image on the tilma spoke the truth of the Christian faith that the Spanish Catholic missionaries proclaimed. A mass conversion of millions upon millions of Aztecs to the Catholic faith soon followed--ending the human sacrifices, especially child sacrifices, that they practiced. 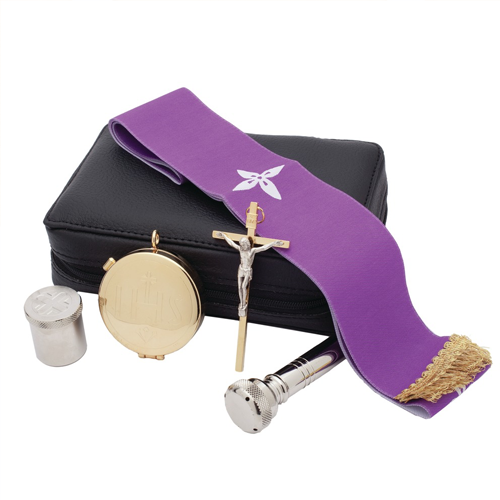 Many Church historians also connect this mass conversion of souls to the Catholic faith as heaven's balance to the massive number of souls who left the Church during the Protestant revolt, a tragedy which was happening during the same period in Catholic Europe. A church was built at Our Lady's request on the Hill of Tepeyac to mark the apparition site, and today it is the most visited Catholic pilgrimage shrine in the world. Venerated in this cathedral is the original tilma of St. Juan Diego, which still displays the miraculous Our Lady of Guadalupe image. The image has been subjected to scientific testing to prove its authenticity and miraculous properties. 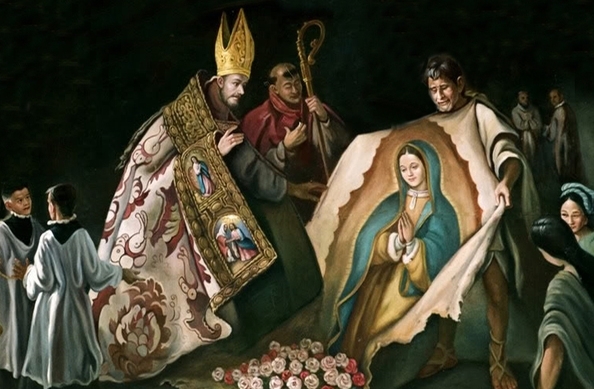 View a video presentation which further explains many miraculous features and occurrences surrounding the Guadalupe image of the Virgin Mary below. 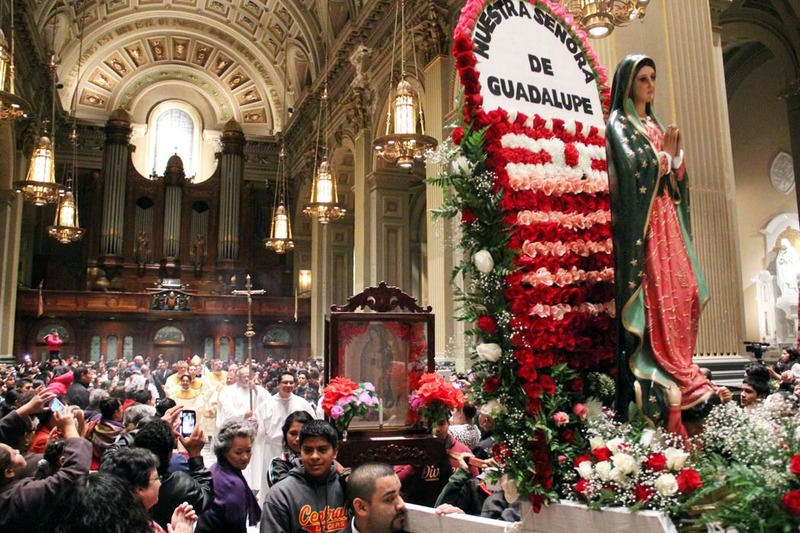 The Knights of Columbus have great resources on the miraculous image of Our Lady of Guadulape, to whom the organization has a special devotion. Visit their interactive website Secrets of the Guadalupe image. 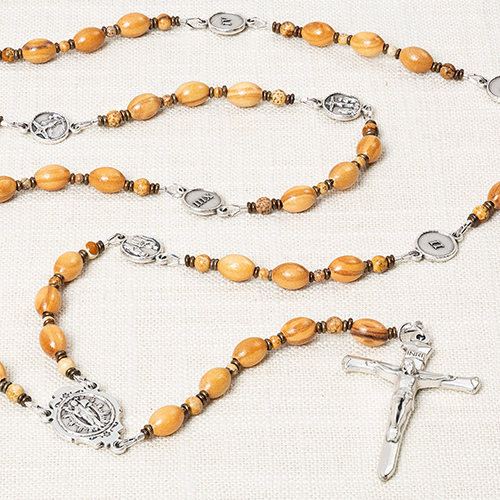 Many parishes with large Hispanic populations have a special celebrations and processions leading up to the December 12th feast of Our Lady of Guadalupe. Find one of these events happening in your local community, and join in the celebration! The strength of devotion of the Mexican people, true of most Latin countries, is simply amazing, and you will be inspired by the overflow of love for Our Lady. 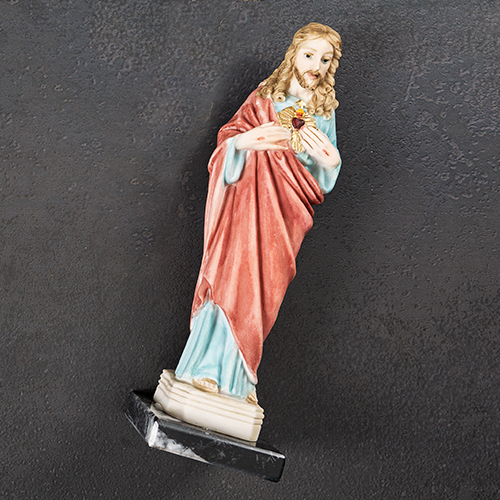 Many parishes, in addition to having a special feast day Mass, will also host a reception or party in honor of the feast day. If not, hold your own celebration of Our Lady by inviting friends and family to your home for a traditional Mexican meal. 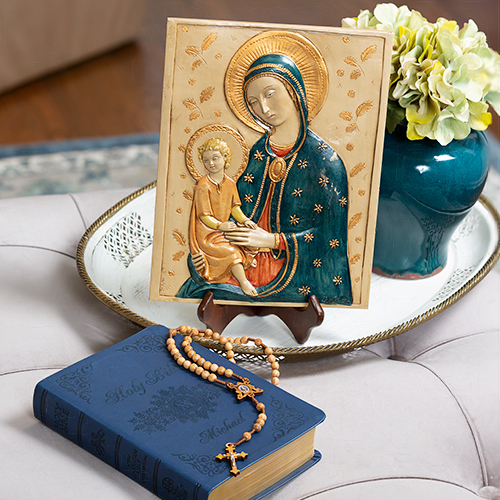 Decorate your table with colorful flowers in bright reds and pinks, blues and greens, and together recite the prayer (below) to Our Lady written by Pope St. John Paul II. 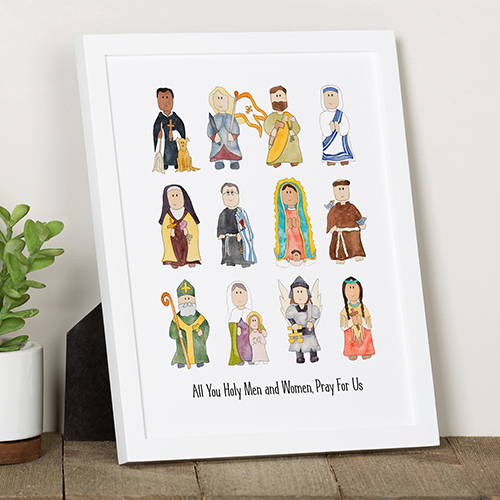 You can purchase a framed image of Our Lady of Guadalupe, as well as prayer cards to distribute, rosaries to pray with, statues to display, and many other Our Lady of Guadalupe devotional gifts to increase devotion to Our Lady of Guadalupe. 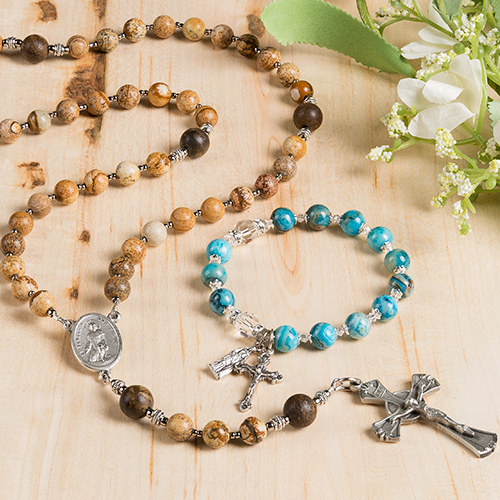 You can also dedicate your home and family to her patronage with a home Enthronement of Our Lady of Guadalupe ceremony using a blessed image. If you have kids, you'll love this simply adorable Our Lady of Guadalupe coloring and decoration craft that you can download from your computer and print. 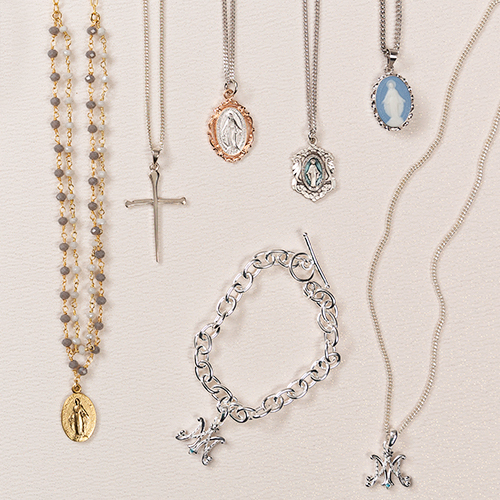 For kids and adults there are also lots of Gift Ideas to Express Your Devotion to Our Lady of Guadalupe. 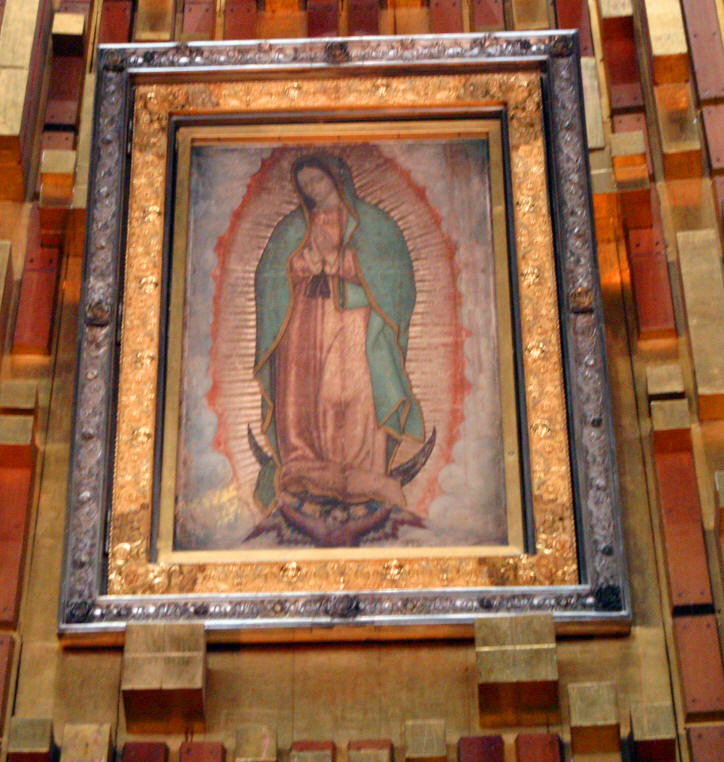 Hopefully the information in this article will encourage or renew your love for Our Lady of Guadalupe, to seek her intercession (especially for the causes of which she is patroness: the Americas, the New Evangelization, and unborn children), and to celebrate her feast day in a special way each and every year. Our Lady of Guadalupe, pray for us! "O Immaculate Virgin, Mother of the true God and Mother of the Church!, who from this place reveal your clemency and your pity to all those who ask for your protection, hear the prayer that we address to you with filial trust, and present it to your Son Jesus, our sole Redeemer. Thus, Most Holy Mother, with the peace of God in our conscience, with our hearts free from evil and hatred, we will be able to bring to all true joy and true peace, which come to us from your son, our Lord Jesus Christ, who with God the Father and the Holy Spirit, lives and reigns for ever and ever. Amen." This article has been updated and was originally published in December 2012. 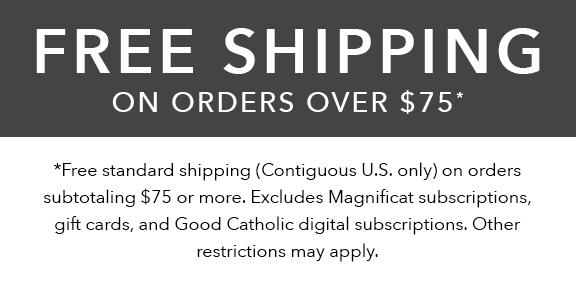 Copyright © The Catholic Company. All rights reserved. thank you to all the men and women for their efforts and precious time dedicated to our Lady of Guadalupe ,it is EXTRAORDINARY,BEAUTIFUL. Our family have a beautiful picture of Our Lady of Guadalupe in the living room, and when I was watching the video in my lap top, my eyes started crying of Joy, I pray at that time for peace among all of us and to provide wisdom and humility to World Leaders.Amen. I was reading a book on Lourdes on Monday and it mentioned Our Lady of Guadalupe. I googled her to find out more. I had often seen the image but hadn't realised its story until then. I hadn't realised Monday was also her feast day until now. A miraculous coincidence for which I am always grateful. Such a lovely blog you have. Keep up the great work! Iam a clinical nurses practitioner working in South Africa though both my husband and l are from Zambia. Iam dedicated to our lady and back home in Zambia l have three posters on metal of our lady of Quadalupe at different sites. My home village is in the Northern part of zambia in kasama District in the chilubula mission area but on the Luwingu road before Lubushi serminary. One poster is by the road side ,another at the junction to the farm and another at the farm, ln 2013 when l visited we decided to hold prayers before sunday to dedicate to our lady since we intended to leave the farm before sunday.When l was reading the catholic daily devotion later, l noted that the day we held the prayers was on the feast of our lady of Quadalupe. Last year we had a small nice cerebration with the villagers around the farm and lam in the process of ordering the statue in preparation for another cerebration on 12th December where l intend to invite near by village parishes and a priest if we get hold of one, people stop by to ask about our lady of Quadalupe and my niece tries to explain from what l narrated to her. I would be happy to get prayer cards with the image of our lady of Quadalupe for distribution thus making people aware of the apparition in our area since we have so many catholics. lam willing to pay for them. With love in the Lord, Rosemary. Many people travel half way around the World to visit religious sites but have not been to visit Our Lady of Guadalupe. Many people in North America have forgotten about her and are taken up by Medjugorje, which has not been approved by the church and is in great question at this time. People must have faith in Our Lady of Guadalupe, she was the first apparition; the only one to leave us a portrait of herself; the only apparition in which she appeared with our Lord Jesus Christ in her womb. Dear Mother Mary, Please bless our little granddaughter still snuggled in our daughter in law's womb. Bless her so she may be a special gift to our family and that she will grow in grace and love and wisdom, and be healthy, God willing through your intercession and the love of your Son. Also, please guide all mothers to be with the strong desire to save and nurture their unborn children to grow up and have goodness in their hearts in this world. You know what is best and we will follow your guidance and His, and you know our hearts and wishes if they be in accordance with yours. Thank you. Amen. Thank you for your protection, help, and intercessions Lady of Guadalupe..I love you. always felt privileged and protected by her. Whenever I have problems I call on Her, tell her my fears, put it all in Her hands and know all will be well. Mama Mary is with us always! Pray for us Mary and protect the Unborn. As Danny I can say: Mexican but above all guadalupan. As Claudio OrdÃ³Ã±ez Urrutia I would ask also for a traduction in German and Italian if someone can help me thank you. I love you, sweat mother Mary!!! We are Mexicans but above all we are guadalupans. Here in Mexico we say: Somos mexicanos pero sobre todo guadalupanos. 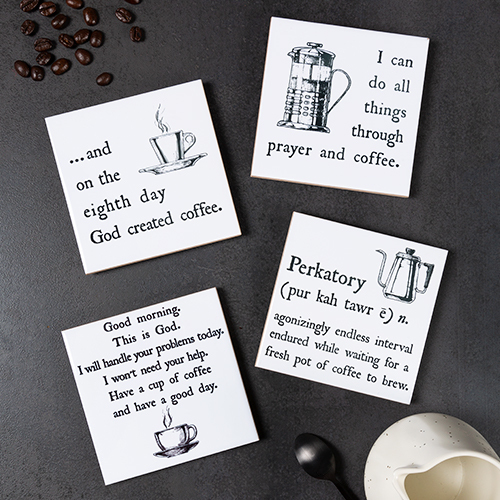 Thank you for any hint you can give me. There is a possibility to obtain this beautiful information in german? Our Lady of Guadalupe, please pray for us and protect the Unborn! Greetings from Guatemala City! I always realize that the image of Guadalupe is the real "photograph" of our sweat Mother Mary, "painted" by GodÂ´s will. So it is how she looks like in heaven and we can see her! She came for us all. Praised be the Lord, and blessings for you, my brothers in Christ. as a good mexican I love to Mary of Guadalupe as the Mather of Trully God. Bendito sea Dios y que linda nuestra Morenita..... Son cienos y cientos tus hijos que vienen a cantarte, saludarte y traerte flores.......Que Viva La Morenita del Tepeyac! God bless and Mary protect Mexico! !